Finally, You Can Get Less Than a Full Roll of Top Quality Twitchell™ Textilene® 90 Solar Screen!! Now You Can Buy Twitchell™ Textilene® by the Linear Foot. Textilene® 90% solar screen material provides the ultimate heat/UV blockage and daytime privacy with a little loss in outward visibility. 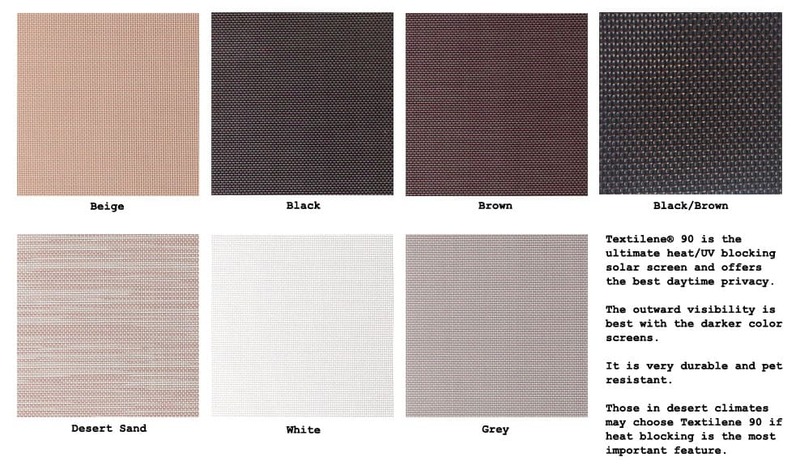 Textilene® 90 Solar Screen Fabric is woven of extremely strong and durable PVC coated polyester yarns. The uniform weave design offers good outward visibility and ventilation. Shading is approximately 90% and Textilene® is available in a choice of six earth tone colors. The fabric is also pet resistant making it ideal for use in doors and full-length screen panels. Textilene® 90 may be desired in desert climates or when the best daytime privacy is important. Less than Full Rolls are Special Cut and are Non-Refundable. Minimum of 10 Linear Feet per Order. Color Select Black/Brown Black Brown Grey Desert Sand Beige Show Colors? Textilene90 Screen Fabric is great to work with. Just square window frame and lay out the fabric with needed fabric to roll into groves before inserting the spline. Fabric stays squared and tight. Advantages: Advantage to buying it by the linear foot, it allows you to purchase the amount needed, not having waste. A singe blade razor blade laid flat on frame works great in trimming off the excess. Disadvantages: I found no disadvantages in using the fabric. Excellent online information and ordering process. Solar screen 90 is a perfect resolution to big plate glass windows facing Tocky zmountsin National Park. The western afternoon sun was blinding. Had semi-permanent screens built and problem is solved. Great product and service. I found this company online after much research on solar screens and supplies. They are a wealth of informtion, have products that are durable reasonable prices compared to othe suppliers.the product came fast an in good condition. I will be using them again to finish all my half screens into full screen on my double hung windows. From the on-line ordering process through the communication with the support staff and quick delivering was an excellent experience. Got 25 feet and it was perfect for my need. Great to be able to order by the foot. Material is high quality and has already proven to be able to withstand high wind. This is the third time I have purchased the solar screen fabric. We have homes in Arizona and I have used the 80/20 desert sand product on several windows on the west side of another home we have purchased. Love the selection of colors. I prefer the 80/20 because I like to be able to look out the windows and enjoy the trees and mountains. Delivery is super quick. I've always been a DIY person and the finished product looks like a professional did it. I will be ordering the 90/10 in the future to make some patio screens....we like our privacy when sitting outside in the yard. I have also used this fabric for window covers on our motorhome. Advantages: Top of the line sturdy fabric, able to order whatever yardage I need. Would cost quite a bit to hire a business to do this. Disadvantages: At age 75 I need to develop a little more muscle power to get the spline snug in the frame. Took me a few tries, but I got it. I was pleasantly surprised at the heat reduction. I am pleased with the added security. I used the screen for windows in a class A motor home. I attached to the inside of the coach so did not have to use a ladder on the outside. Advantages: Easy to cut to the window shape. Disadvantages: The heat on the walls was high enough to prevent sticky back velcor and Gorilla mounting tape to stick to the screen. I suspect both would have worked in a lower temp application. I did not try iron on velco. The sticky back velcro did stick to the interior walls. May be a surface area issue with the screen. I sewed the velcor to the screen. Screens came on time exactly as ordered. Quality product fairly priced.